As a general sign company, Electro Signs can offer the best of both worlds. Our in house craftsman can turn their hands from the latest technology to the traditional skills. We are proud to offer quality signwriting, gold leafing, hand painted pictorials, sand blasted signage, wooden letters gold leafed (Hovis type), metal letters on locators, brass, copper etc. 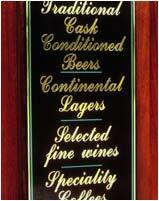 as well as all traditional requirement of the pub hotel and retail sectors.